(1) He's about ten majors ahead of anybody who would be considered a remote threat to his reign over all things golf. He could smoke two packs a day and eat chili cheese fries every meal and still break the Golden Bear's record for majors by 2010. (2) His head appears to still be the same size as it was when he was the skinny kid in the red shirt in 1997. Call this the Barry Test. 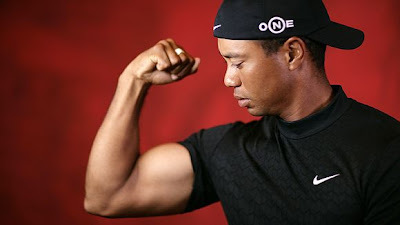 Really, the question is this: What would happen if Tiger and Tim Tebow decided to throw hands? I'm convinced it would be like the last 45 minutes of Transformers where the entire city got torn to shreds by the giant robots fighting each other, and it was really hard to figure out who won. In the end, there would be no winners. And in fact the real losers would be everyone living in the path of Tiger v Tebow. I think this is a part of a plan Eldrick has to take over the world. He is forming himself into an unrivaled physical specimen that will be able to battle any hero the combined World nations would be able to throw at him. I am convinced that this could happen in the near future, so let me be the first to say, " All Hail Lord Tiger, long may he reign!!!" Call me crazy, but for any normal human the candy hanging off Tebow's arm would be oh so sweet. That is Tebow. He can do better. I liked the Erin Andrews line all good but I really don't know where your going with the Tiger and Tebow pics. whats next top gun.